You’ve decided to pick up the drum sticks? Good choice: drumming is fun, drumming is healthy, and drummers are a great bunch of people! But first things first: what’s the best beginner drum set? After all, this will cost you a few hundred dollars, so you might not want to engage in pure trial and error. 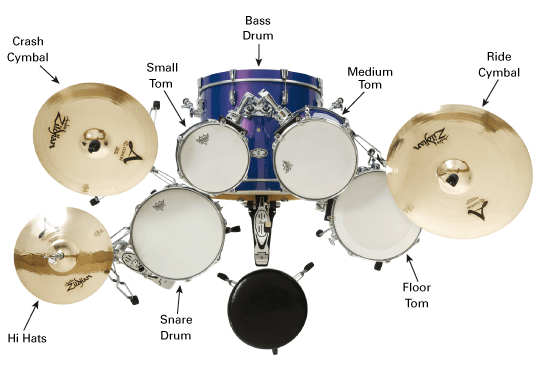 That’s why I’ve distilled the essence of all individual beginner drum set reviews on Kickstart Your Drumming into this article. I’ve kept it short for each set, but included links to the individual reviews in case you want to dig deeper. And please make sure to check out the buyer’s guide at the end. This will tell you what to look for in a starter kit – and what to ignore. If you decide to buy one of the products reviewed here, please consider going through the links on this site, because this will earn me a small commission – at absolutely (!) no extra cost to you. I’ve poured my heart and lots of time into these reviews, and by using my links you help ensure that future readers will find this site still working. Also, if you’re looking to buy only the cheapest beginner drum kits, read this article too. Want to give it a listen before jumping into the overview? The Mendini gives a completely decent drum sound. And you can’t take that for granted at the price. One more good thing though: you can choose from 7 color options. And I’ve experienced numerous times with my students that color does influence one’s motivation to practice a lot. 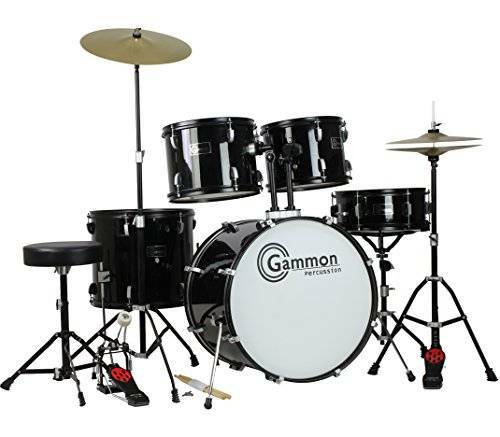 As you can hear, the Gammon is very similar to the Mendini: the drums sound decent and that’s surprising when considering the price. The cymbals however are clearly low-quality. This is unfortunate but normal. Why? I’ll tell you in my in-depth review of the Gammon drum set. I also think the Pearl Roadshow looks more professional than the Gammon or the Mendini, so that this is a drum set for practicing as well as for the stage. And audiences will judge you by your looks! Plus: the cymbals are a tiny bit better than those on the Gammon and Mendini kits. That said, they are still stock cymbals and can’t be compared with brand cymbals (which don’t have to be all that expensive – see the cymbals section below). The Pearl Roadshow is my best beginner drum set and will be a companion for a good few years of drumming! And if you want to know why exactly, check out my full Pearl Roadshow review. Still, if you’re an ambitious beginner willing to spend some money, this kit can take you a long way into your drumming career. See what John, who recently bought it, has to say about the Export. The Export is also available in a beautiful lacquer finish. Then it’s more glossy and has visible wood grains. Looking for current deals on this kit? Still have a question or some doubts about it? Find out if there are any in my full Pearl Export review. The bass drum pedal has a metal base. Stock heads are not good. 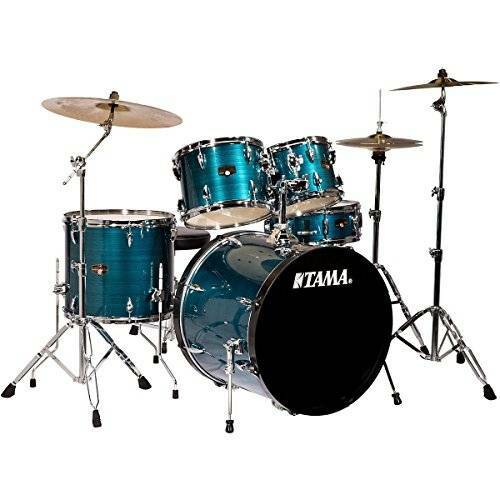 The Tama Imperialstar comes complete with drums, cymbals and hardware and is a great kit for a beginner who is getting his first drum kit and wants to get everything he needs in one purchase. The shells are made from poplar wood which means the drums make a bright and focused tone. 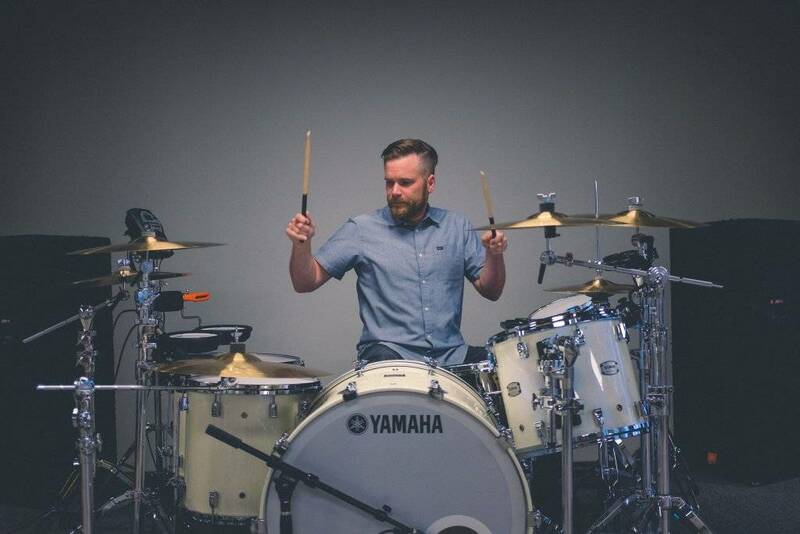 The kit has a 14″ snare drum which sounds very impressive and the toms come in sizes 10″, 12″ and 16″ (as a floor tom) – as well as a 22″ kick drum. The cymbals are part of the decent Meinl HCS series and include 14″ hihats, a 16″ crash cymbal, and a 20″ ride cymbal. As you have seen with the other kits above which mostly come with lower-quality stock cymbals – having a set of Meinl cymbals right out of the box is a serious plus. I’ve shown you the drum kits I highly recommend for beginners. But this might well not be enough for you. For I believe there never is THE best drum kit. A drum set can only be best relative to YOUR purpose and circumstances. What do you want to do with your set? Practice, play live on stage or home record? When making that decision don’t only take into account the tomorrow. Think about the next 2-5 years of your drumming journey and where you might be by that time. For you can easily keep your first drum set for that long. In case you’re not even sure whether you’ll stick with drumming, I recommend: go budget! That is, go for a practice kit (the Pearl Roadshow). If you’re dead set on home recording, I suggest you look at my electronic drum set reviews. Electronic kits make home recording way cheaper and easier. Again, I’ve shown you the best starter drum sets for adults. In terms of size, this means that anyone taller than 5ft will comfortably fit behind all the sets presented here. If you’re looking for a drum set for someone shorter than 5ft, can check out my best junior drum set review. You won’t need more until a good few years into your drumming journey – unless you’re trying to show off. Cymbals are important – you’ll play them more frequently than some of the drums. So it’s good that all kits except the Pearl Export come with cymbals included. 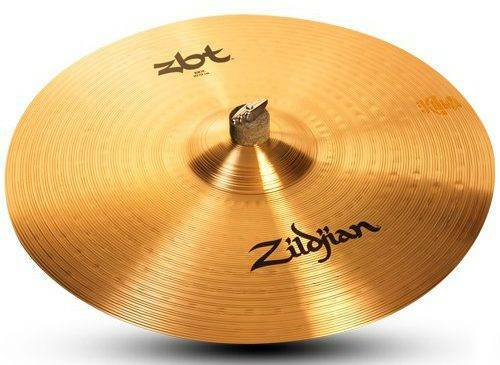 A ride cymbal is larger and thicker than a crash, and without it you’ll be loosing out on the higher pitched cymbal sounds that accompany many guitar solos and choruses. 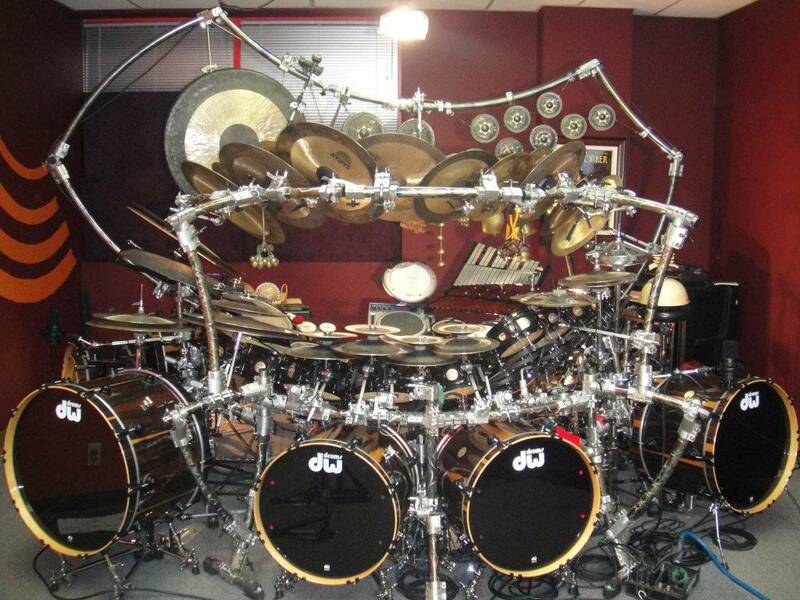 So with only two cymbals you won’t be able to play everything you hear on the radio exactly as it’s played there. I’m saying this only so you know. It is not crucial to add a ride cymbal now, but it will be probably happen sooner or later. And while you’ll probably need to play around with tuning for a bit to get it right, you don’t need to read whole books on it. Start with this tutorial, try to grasp how it basically works. Then just play around with your heads. And speaking of heads: start with the ones that come with any of the drum kits above. With the right tuning, you can greatly improve their sound. Only once that’s not enough for you any more: buy new heads. Compared to the wonders they work, they aren’t too expensive. And choosing them is easy too – at least with this guide of mine. Which wood? Shell sizes? Which loops? Which snare carpet? These things do make differences in sound, but none of them are huge and none of them matter much to drum beginners. At worst, they will confuse you or cost you money. Take care of your tuning first and ignore the rest for now. Better invest your time and money in good drum instructors. I know you would enjoy finding one of those kits above at a discounted price, wouldn’t you? If so, this guide on how to find discounted drum kits is for you. the Pearl Roadshow if you’re in for the long run and don’t want to swap kits after two years. the Pearl Export if you’re an ambitious beginner who wants to go for an advanced drum set at an unbeatable price. I hope this best beginner drum set review helps you make your buying decision. If not (or if you disagree with anything), let me know in the comments. I respond 100%! Best of luck finding your new drum kit and lots of fun playing it! If this best beginner drum set review was helpful to you and if you decide on a beginner drum set to buy, please consider going through one of the links / buttons on this page. This way I receive a commission and you reward me for the time and care I put into writing these reviews. Please note that I have no incentive to favor any products, since I receive a commission no matter which drum kit you pick (if you do). You can read more about my review ethics in my affiliate disclosure. Hi, thank you for the review. Could you please tell me why other people says that the Roadshow is a junior kit when it has 22″ bass drums like the standard drumsets? just about the size of the Export right? 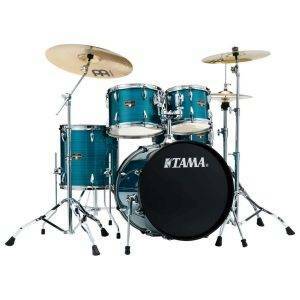 And what are the counter-part of the roadshow in Tama, Yamaha, Sonor? The Pearl Roadshow is certainly no junior kit. As you say: it has a 22″ bass drum and I don’t know which child would be able to play on that comfortably. No, it’s a full-size drum set just like the Export. Actually, Tama and Sonor have no drum kit whatsoever in that price range. Yamaha its Gigmaker model, but in my eyes this can’t compete with the Pearl Roadshow. Hi, the roadshow in this video sounds great, really. But why does other roadshows in youtube sounds bad? Glad you asked! Well, there are lots of variables to how a drum set sounds (quality of heads, material of shells, recording device, track edited or not, room etc. etc.). And the Roadshow will sound differently for everybody, because when you unbox it, you’ll have to tune it. And from my experience tuning is also the 1 variable that can improve a drum set sound by 80%. If you get this right, the Pearl Roadshow will sound very decent for you out of the box. See how much tuning can do here and then start learning it here. Play around with tuning your kit. That’s the best way to become good at it. If you know how to tune and you can’t get the sound right, consider buying new heads. I’ve written a full guide on drum heads here. This has worked wonders for me in the past and is also the cheapest way of all to improve a drum kit’s sound. What do you think of the Rise kit by Sawtooth? Thanks for asking. I hadn’t actually looked at the Rise kit for a long time. And apparently with good reason: a rating of 1 star out of 3 reviews is unheard of on Amazon (in a bad way). Now, I haven’t played it myself, and I wouldn’t want to keep you from trying it out when only 1 reviewer had something bad to say about it. But three 1-star reviews is too much to my mind. I wouldn’t take the risk. 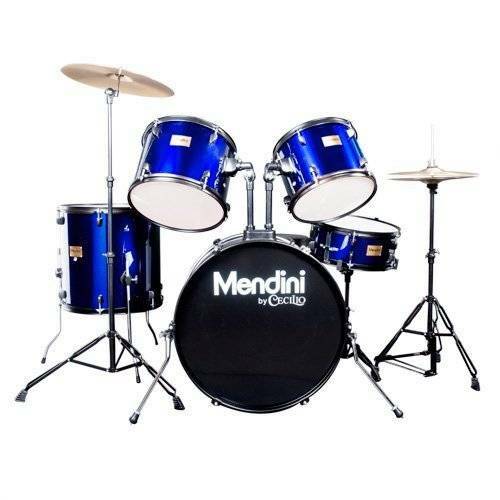 Why not go with the Mendini drum kit instead? I can personally attest that you get good quality for the money there. Plus: it’s currently discounted quite a bit. May I ask who the drum set is for and for what purpose it’ll be used for (practicing? first-ever kit?)? Thanks for answering! It’s for me….I have been playing on and off since 1973 and just wanted an inexpensive set for practice, but also one that was stage-worthy. The blue sparkle set looked very nice compared to the others. Alright, I see. If you want to go up on stage with your set, I’d honestly like to nudge you away from the Mendini. Mendini isn’t a rcognized drum set brand and itn terms of both sound and design it’s (to my mind) more of a practice kit. Once you go up on stage, you will notice the kind of drum set you play on has quite some influence on how the audience (as well as other drummers) perceive your playing. I don’t like this sort of outer-appearance-over-what-you-can-actually-do-on-the drums approach, but in my experience this is how the game works. So if you want to make a longer-term investment and really get a good set for both practice and the stage, I recommend you read up on the Pearl Roadshow above. It’s a fabulous set that I’ve taken up on stage. Sure, it’s more expensive than the Mendini, but in terms of what you get it’s quite another league. Hi, a drummer friend of mine recently suggested the Ludwig Breakbeats as my beginner drum set. I’m currently deciding between the Ludwig and Pearl Roadshow. Any suggestions regarding which one to get? Thanks! That depends on what you want to use the set for and on your budget. The Ludwig Breakbeats is a compact drum kit designed specifically for people who regularly carrry it around to gigs in small venues. Therefore it has a smaller bass drum than the Pearl (16” vs. 22”) and that does make a difference in sound. The Breakbeats also comes without cymbals, so you’d have to spend some extra money on a good budget pack of those. I’ve written about the Ludwig Breakbeats in depth here. The Pearl does come with cymbals (although stock cymbals are never great), has a standard-sized bass drum and one more tom then Breakbeats. Let me know how you decide – and when you do so, I’d be more than grateful if you purchased through one of the links on my site! I ordered a Roadshow as a lighter set to use instead of my Pearl sessions , and sent it back pronto.I don’t think Pearl should put their name on them.I’m cosidering an export fusion instead.What do you think of the exports for an experienced gigging drummer? Sorry the Roadshow wasn’t for you. I like it a lot, but as so often in drumming, it comes down to personal preference in the end – especially for you as an experienced drummer who will have played much more expensive kits I guess. Anyway, have you read my Pearl Export review? I’ve happily played lots of gigs with it and especially like the versatility in terms of sound. With a good knowledge of tuning I’ve been able to get a punchy sound of it in both small and larger venues. Hi! Any thoughts on the Mapex Tornado? Thanks! If you want a kit that will accompany you for years and in any setting (practicing and live), I recommend you consider the Pearl Roadshow! What’s your opinion of the Percussion Plus PP4100 set? Our local music store is selling these for $249-299 with one free $25 lesson thrown in which puts it in the same price range as the Gammon that we are also considering. This set would be used by myself (adult male) and also our 6 1/2 year old son who wants to play. Thanks! Thanks for your question! The Percussion Plus is very similar to the Gammon kit. I only didn’t mention and/or recommend here, because it costs $500+ on Amazon and that is certainly overpriced in my opinion. If you can get it for for the price you mentioned, though, that’s a good deal – especially with the lesson on top. As for your son, age is not the deciding factor – size is. Please read my kids drum set article to find out if he’s ready for an adult set (you’ll be fine on this). Thank you for your tips! They will be very handy ! Which would you say is the best kit between Ludwig accent drive, Mapex rebel and Pearl Roadshow ? Thank you. Thanks very much for your question – which also reminds me that I should finally put up a review of the Mapex Rebel and the Ludwig Accent Drive. I appreciate it! So it really depends on what you prioritize. If it’s price, you might want to go with the Ludwig Accent. 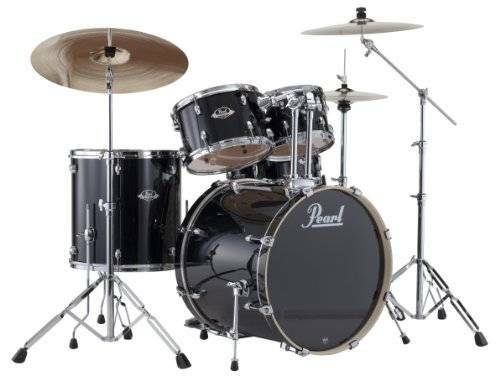 If it’s having the right kind of setup for you style of music / drumming, the Pearl Roadshow would be the kit to go with. My personal opinion is to prioritize the setup and go with the Roadshow, since if you pick the right setup now, you could easily play this set for years and years and years. Haha, that’s very cool Simon! And seriously: I think airdrumming is a great way to perpare for being a great drummer. When rehearsing with my band, we use a (very cheap and nasty) electronic kit and I was considering buying something just a little better (Alesis Nitro or Forge are the likely candidates). I was wondering what your views might be regarding an electronic kit for a total beginner? Our drummer seems to get by with the existing kit, but he’s already an accomplished musician and could probably make a set of cardboard boxes sound good. I know nothing about playing drums, but since the kit would be permanently available to me, I really fancy having a go myself. What concerns me is, is starting on an electronic kit going to complicate the move to an acoustic kit or would the transition (should I ever make it) be fairly easy? I can totally relate to your concern and that’s why I only recommend electronic kits that are setup exactly like acoustic drum kits, so that you won’t have to unlearn any of the moves you’ve stored in your muscle memory while playing on the electronic kit. So I see no reason why you couldn’t start on an electronic kit – and both the Nitro and the Forge are favorites of mine. Thanks for the quick response. I would be setting up as a ‘normal’ kit. I did look at the ‘table’ type kits, but I could see they would be totally different, compared to a ‘proper’ kit, when it came to playing one- So you’ll be pleased to know I have purchased a Forge kit this very day. Now I can’t wait for it to arrive 🙂 . That sounds amazing, Graeme! I wish you lots of fun with it! And if any questions come up: just drop me another comment! 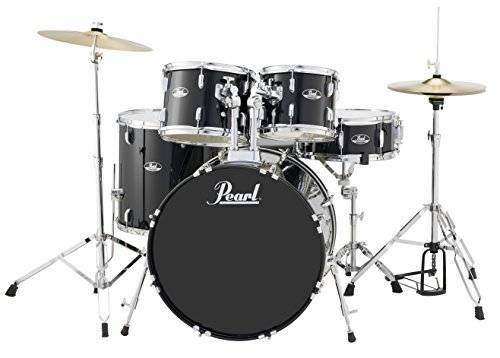 I think the Mapex Rebel drum sets may be new and I am wondering how they compare to the Pearl Roadshows which they seem to be priced to go up against. The RB5044FTCDK contains a 22″ bass drum while other models contain a 20″. Have you tried one of these out? Would be interested in your opinion! Thanks for your question – I’m in the process of reviewing the Mapex Rebel, so right now I can only tell you that I think the Rebel is a well-made drum kit, but I still think that the Roadshow has the range of different setups going for it. Do you want me to let you know once I’ve finished and published the Mapex Rebel review? I recently bought the Pearl Export series and it sounds AMAZING! I purchased Sabian cymbals and used stock drum heads, and it sounds way better than I imagined. This video about it helped a lot and now I am using the drum in my studio and on the stage. At first, though, the toms were not in tune as well as I hoped, so I had to learn how to tune it on youtube, but other than that there is absolutely nothing wrong with this drum. That’s awesome! Thanks so much for sharing this. I’ve linked to your comment from within the post as I think this would benefit all visitors. Hi! I was just at the music store shopping for a drum set for my 7 year old son. It’s very difficult to understand if the girl we chatted with is selling me on stuff for commission or really telling me the truth. I went in to buy the Pearl Roadshow. She was trying convince me the cymbals will bend within 2-3 months so going with the Tama Imperialstar or Ludwig Accent was my best bet since I would have to replace the stock cymbals with the Roadshow. She said the Pearl export would be ok but the set doesn’t come with cymbals. My son is a beginner. His drum teacher is telling me to go with great “used” drums. The Ludwig Accent has a similar kind of stock cymbals as the Pearl Roadshow – so if she’s convinced that the cymbals bend, they will bend on the Ludwig Accent too. That said, I don’t share this opinion and in fact I haven’t seen a student of mine bend his / her cymbals on the Roadshow. It’s true that the cymbals aren’t great and that you’ll likely have to replace them as your son develops a better and better ear for the sound of his drums. But most of my students use these cymbals for 1-2 years at least. She is right, however, that the Tama comes with better cymbals (Meinl CHS) – but, online at least, they also cost significantly more. So your decisions comes down to paying more now for a better cymbal sound from the start (Tama Imperialstar) – or saving some money now and buy better cymbals in a year or 2 (Pearl Roadshow). I’m In my early 50’s, quite tall (6’8″) and am finally going to take the plunge and get a kit and hopefully let this old dog learn a new trick. I’ve been looking at used kits on-line and new ones. I’ve somewhat narrowed it down to a new all-inclusive Ludwig Accent which are readily available for $399 on Amazon or a used Pearl Export kit that I’m finding in my area for around $350. I think you mentioned you have an Accent review coming??? Buying second hand makes me nervous because I’m no expert and don’t want to get stuck with something that may possibly bring headaches rather than enjoyment. That said, will the Ludwig Accent with upgraded heads and cymbals down the road foot the bill as I progress? My goals are to have fun while challenging my brain, jamming in the basement with friends, and maybe playing in church or small settings. We’ll see how my dominant left brain works with the other side. Please weigh in and thanks for your help! Great you’re getting into drumming! Please let me know how it goes down the line! As for the kit, I haven’t been able to test the Ludwig Accent yet, so I can only say that it looks decent and that I’ve heard good things about it. Have you had a look at the Pearl Roadshow? It costs slightly more but is my favorite beginner drum kit for the reasons explained above and here (standalone review). Great and informative website. If possible, I would like to buy a kit that I can use as well as my kids as I really don’t want to have 2 kits in the house. My youngest is 11 and about 4’3″ (but growing like weed). Although I have played guitar in several bands, I am a relative newcomer to drumming. Is it possible to have a kit that would work for all of us? After reviewing your site, I was thinking the Pearl roadshow but would appreciate any insight you offer. Thanks so much for your kind words. I appreciate it very much! 4’3” is still a littler short of what I’d consider ideal for an adult drum kit as you suggested, but if he / she really is growing that quickly the 5′ mark should be reached pretty quickly. So yes, I do think an adult drum set would work for all of you. And the Pearl Roadshow is my favorite option in terms of value for the price. If you want to go more professional, check out the Pearl Export. Yet, I do think the Pearl Roadshow will give you everything you need to happily drum for a long time to come. Hope that helps – if not, keep the questions coming! I am looking for a drum set for my son. He is 4’2″, junior drum sets are upto 5′. Now I don’t want to buy a new set in couple years. Do you think I should just get the Full size and let me grow to it. On the other hand my younger son has just started classes as well and he is 3’8″. Please assist. Thanks for your question. In that case, I’d go with a junior kit. It will gentler on your older son’s back and muscles overall – and the young one will be able to play it for quite some time. do you have any opinion on PDP Z5 or Encore ? they’re sold at all the on line stores and are on sale right now, they seem to get good reviews on the stores websites but no one ever mentions them on websites such as yours…am I to assume they are just not very good ? So have you looked at the Pearl Roadshow and ruled it out? The price should be about the same.